It is now a collection of privately owned houses and farmland. In 1865 the Duke of Argyll described it as "not very far from bring a model Highland village now"
Discussing the layout of farm steadings - replacing the pigstys with dungheaps that are normally beside the house with gardens. "With regard to the tenantry of this property some reference was made to this subject just four years ago, and reference was also made to the propriety of having gardens. I must say that, especially in some instances, very great and successful exertions have been made, and I would particularly instance the tenantry of the great toon of Auchnagoul. I really was excessively delighted, and so was the Duchess, the other day in visiting that important toon, to find the houses so extremely tidily and nicely kept, and the gardens so nicely kept; and I think I may say without exaggeration that, although there may be some shortcomings yet, the toon of Auchnagoul is not very far from bring a model Highland village now. In 1875, when Queen Victoria visited her daughter Princess Louise, Duchess of Argyll, she went on a carriage drive from Inveraray to Furnace and back along the shore road. As they passed the townships of Auchnagoul and Auchindrain the Duke described them as being of few left of their kind in Scotland. 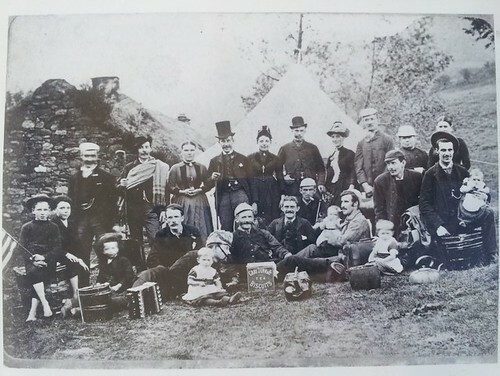 The newspaper articles illustrate how much work has been done at the Township in the middle of the 1800's and the very close and intimate involvement and interest in these communities along the glen by both the Duke and the Duchess of Argyll. Both are reported to have visited Auchnagoul particularly, repeatedly to develop a new way of living to move the township on from the very primitive lifestyle in the earlier part of the decade. The Duke's detailed description of the townships that he gives to the Queen later can be interpreted in various ways when read alone, but in conjunction with these newspaper reports it could be said that he was PROUD of Auchnagoul and Auchindrain. They were examples of how the improvements in agriculture could be incorporated into an old structure of both community and of buildings, with the goodwill and hard work of the tenants. Improving the agriculture was not just an economic interest to the estate but also a passionate interest and area of study for a number of the Dukes. From the newspaper archives it is clear that the hills around Auchnagoul to Clunary were very popular grouse moors . the shoots are repeatedly reported in a variety of papers in the latter part of the 1800's. Not enough research has been done to download all the newspaper reports from the free archives, nor do we have the funds for the full and updated pay to view ones. The image below is one given to us by a current resident .. we have no idea what age it is, why they are grouped like this, or what the occasion is. If you have any ideas .. please let us know. To view more detail of this image check out this album on flickr.